KAMPALA: Like has been in the recent past, the report on the 2018/2019 national budget drew a short divide amongst MPs on the Budget Committee that led to the production of two reports; majority and minority report. The majority report saw 17 MPs append their signatures, while the Minority report spearheaded by Cecilia Ogwal, (Dokolo Woamn MP) saw four MPs, Ogwal, Muwanga Kivumbi, Joy Atim and Robert Centenary approve contents of the minority report. Ogwal took to the floor of Parliament last week and explained why they disagreed with some of the contents of majority report. Budget framework paper 2018/2019, which represents an increment of Shs3.09Trn. The other area of dissent was the domestic revenues that are projected to rise by Shs863.30Bn with the Opposition MPs accusing the Ministry of Finance of failing to satisfy the Committee on the underlying assumptions that will lead to rise of domestic revenues from Shs15.54Trn to Shs16.41Trn. The MPs rejected the development noting that the revenue projections are marred with limited transparency, thus making it difficult to ascertain the credibility of underlying assumptions. The decision by the Majority MPs to recommend to Parliament to adopt the 2018/2019 report on national budget despite establishing that there is increased external borrowing was met with protest from the other MPs. The report noted that external borrowing is projected to rise from Shs6.77Trn to Shs7.73Trn, warning that the escalating public debt is worrying. The MPs also disagreed over the failure by the Ministry of Finance to provide a detailed breakdown on how the coming budget is going to be financed internally. In the 2018/2019 budget, domestic refinancing which is a debt roll over raised through domestic borrowing is projected to rise by Shs784.9Bn from Shs4.98Trn to Shs5.77Trn. But despite demands made on 24th May 2018 to the Ministry of Finance, to present details pertaining the breakdown of domestic debt stock according to holders; details of domestic debt holders say names of banks, insurance companies, pension and provident funds. The MPs also demanded Government to explain the proposed payment schedule of domestic debt stock, but no additional information was presented, something the opponents of the majority report argued limited their ability to scrutinise the revised domestic debt burden and scale of impact on the economy. Nonetheless, the minority report revealed that the proposed domestic refinancing of Shs5.77Trn has far surpassed the statutory threshold of Shs1.554Trn that is stipulated in the Section 35(5b) of the Public Finance Management Act. 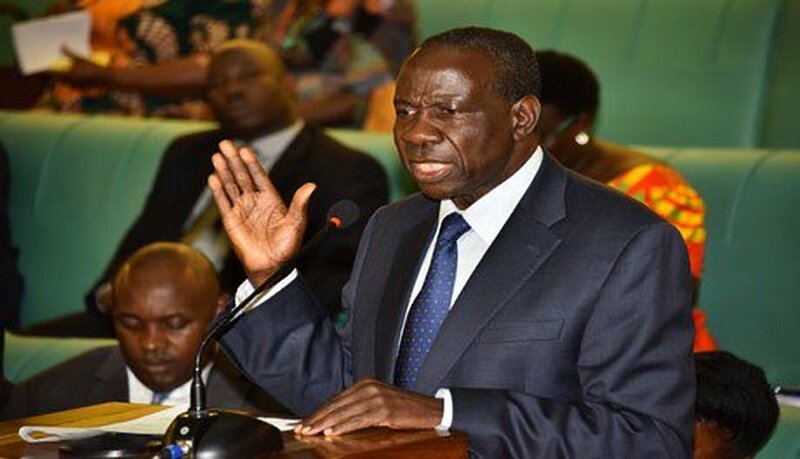 With Government noting that the resource envelop is projected to increase from Shs29.27Trn as approved in the budget framework paper to Shs32.36trn in the 2018/19 as per revised budget estimates, the MPs were angered by the fact that the Minister of Finance didn’t table a motion seeking to adjust the revised resource envelope.